In its 2016 annual Pew Research State of the News Media Report, the Pew Research Center documented that 2015 was another year of alarming declines for newspapers — the worst since the 2008-2009 recession. 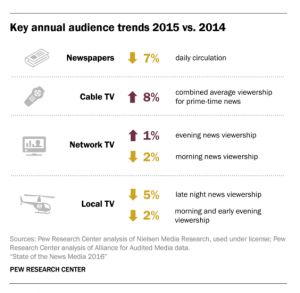 The other local medium suffering news audience loss is local TV. The shrinking of these previously robust audience delivery platforms enhances the position of OOH with its ability to deliver massive reach. Additionally, the OOH consumer isn’t required to subscribe or turn on anything to engage with the ad message. The 2016 Scarborough newspaper readership report (release 2) for CBSA markets reveals the highest daily reach of any individual market newspaper in the US is the Pueblo, CO, Chieftain at 42 percent or less than one-half of the daily OOH reach of 86 percent among consumers ages 18-64. The lowest CBSA reach reported by Scarborough is The Orange County Register in the LA/Long Beach/Anaheim market at 4.2 percent. On the DMA level, the Scarborough numbers are even lower: The Omaha World-Herald reaches 30.4 percent on the high end, and the Racine Journal Times (WI) only reaches 4 percent. In a media environment of shrinking and fragmented audiences, OOH is actually growing in audience. Borrell Associates forecast time spent with OOH will grow 5 percent from 2013-2018, while all other traditional media would decrease except cable TV, which is projected to have an increase of less than 1 percent. That’s why many of the most prominent newspapers are turning to OOH to drive audience engagement including The New York Times, The Wall Street Journal, The Washington Post, The Boston Globe and many more. Most of the ad dollars that used to go to newspaper have been reallocated to digital. 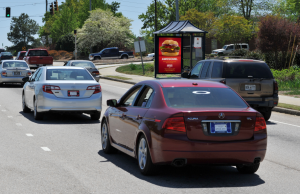 However, even with the explosion of digital media, many of today’s most prolific technology and digital brands are investing significant media dollars in OOH. Among the top 100 OOH advertisers in 2016 were: Amazon, Android, Apple, AT&T, Barracuda, Comcast, Cox, Cylance, Dell, Facebook, Google, Hulu, Lyft, Metro PCS, Microsoft, Netflix, Samsung, Sony, Sprint, T-Mobile, Uber, US Cellular, Verizon, Yahoo and YouTube.